Although Trinidad is in the midst of a recession, fete prices have risen to an average of $100-650 USD (a high of $4,000 TTD). As a result, local patrons are choosing their parties carefully. However, those who decided not to attend Machel Monday are probably regretting that decision today. The event was broadcasted live online for $9.99 USD, but nothing could compare to actually being in the Hasley Crawford Stadium on February 1st. Machel Montano holds the biggest concert of the season on the Monday before j'ouvert every year and patrons have yet to be disappointed. Many Trinidadians consider this the start of their Carnival revelling and with good reason. 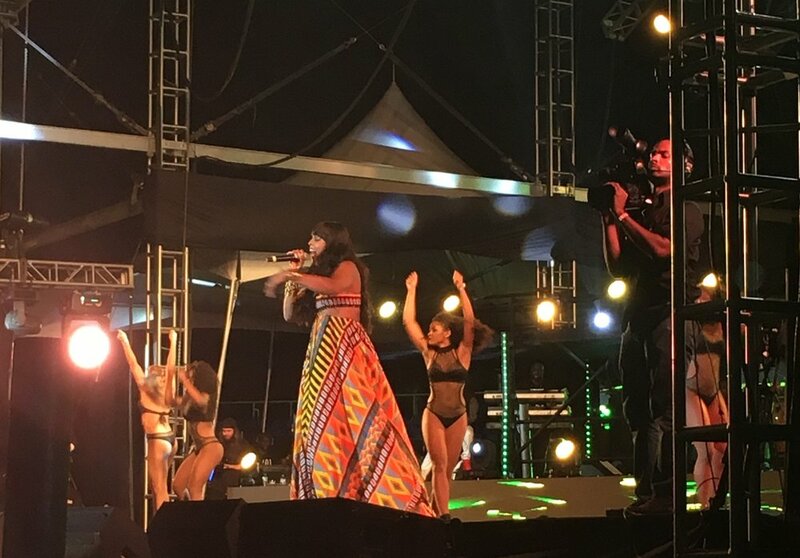 In years past, the "Like Ah Boss" singer brought out guest artists like Shaggy to recreate their hit "Toro," Boyz II Men to perform their collabo "Can't Let Go," and Major Lazer to roll across the Machel Monday crowd. For the sixteenth iteration of his event, Montano took it up several notches. The comedic king of Caribbean dialects Maja Hype, Trinidadian comedian and radio personality, Rodell "Ro'Dey" Cumberbatch, and Toronto's internet sensation Superwoman, all came out to host the show. The guest list did not stop at the hosts. Ravi B. kicked off the parade of artists that included Jamaican singers like Tarrus Riley and Omi, African artists like Runtown and Timaya, international acts like Lil John, Latin Grammy winner Pitbull, EDM gods Walshy Fire and Jillionaire of Major Lazer, and Trinidad's own Kerwin DuBois and Farmer Nappy. Montano used this show as an opportunity to link the future to the past. Newcomers Aaron Duncan and Pternsky out of Morvant assured the audience that soca was indeed in good hands. But the high point of the night was when Chinese Laundry and Signal 2 Noise reunited for a back-in-times segment that featured performances from top names in dancehall like Cutty Ranks and Chaka Demus & Pliers. I feel sorry for anyone who was not inside Machel Monday. You missed an E.P.I.C. event. At $100 USD, this was actually a steal considering that you get to see over 20 artists from different musical genres and great international deejays. If you are in Trinidad next year, plan to arrive in time for Machel Monday. Be sure to get the VIP tickets as this will get you closest to the stage. Note that you will have to reserve additional funds for food and drinks that are on sale during the party. If you want the option to sit during the 6+ hour show, get the $200 USD Diamond ticket. Trust me, though, if the lineup is anything like it was this year, you will stay on your feet. Book your tickets early for Carnival 2017 and leh we go!